Winning the USL Cup is no easy task. Winning it two years in a row? Harder still. Winning it three times in three years? Yet, that is the massive challenge facing Louisville City FC as the club enters the 2019 USL Championship campaign on the back of back-to-back titles. Don’t get me wrong, as it stands today, Louisville City FC is the standard-bearer of the Championship. The club’s run over the past two years has been as remarkable as it has been historic, and everyone – from team President Brad Estes, to Chairman John Neace, to current Head Coach John Hackworth, to the players themselves – deserves tremendous credit for its sustained success over the past 24 months. Add in the fact that a new 11,500-seat stadium is currently under construction in Butchertown and it appears the gas pedal is still firmly planted to the floor in the Derby City. Yet, in this writer’s humble opinion, what has defined LouCity the most over the past two seasons is its resiliency. It has simply been better than any other team in the league at overcoming adversity. Consider for a second the coaching carousel, which took its first turn in late June when former Head Coach James O’Connor departed after three-and-a-half years in charge to take the top job with Major League Soccer’s Orlando City SC. Louisville initially made the bold move of replacing O’Connor with a triumvirate of player-coaches, with injured forward Luke Spencer taking over alongside midfielders George Davis IV and Paolo DelPiccolo. And while the move raised eyebrows across the league, it worked. 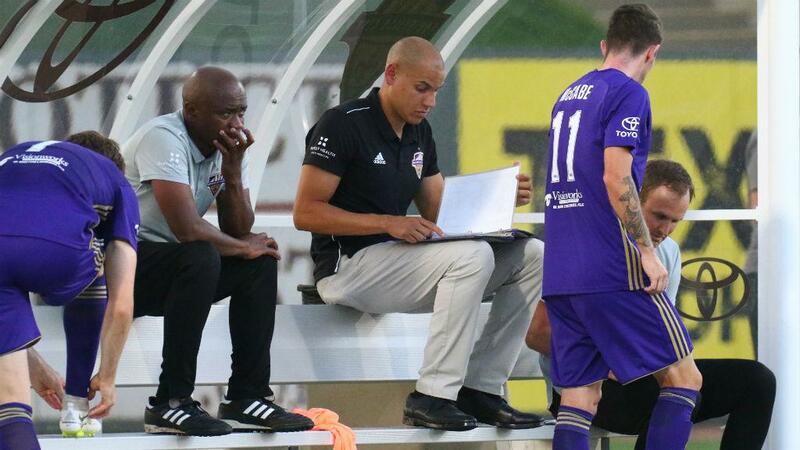 The trio led LouCity to a 4-1-1 record during its tenure, seamlessly bridging the gap between O’Connor’s departure and Hackworth’s arrival in August. To not only survive that stretch but thrive during it told you all you needed to know about the mental fortitude of the locker room, which to no surprise, had little trouble adjusting to its new leader. Aside from a few early bumps – namely a 4-1 defeat to Toronto FC II and a late collapse in a 2-2 draw against Pittsburgh Riverhounds SC – Hackworth came in and kept the Louisville train chugging down the tracks. The side steamrolled to victory in its final six regular-season matches and carried that momentum into the USL Cup Playoffs. Louisville eased to a pair of home victories over Indy Eleven (4-1) and Bethlehem Steel FC (2-0) to reach its fourth consecutive Eastern Conference Final. Less than 10 minutes into that match against the New York Red Bulls II, Louisville encountered another obstacle that it would have to overcome as 2018 Golden Boot Cameron Lancaster, who had set a league record with 25 goals in the regular season, was forced off the pitch with a hamstring injury. Lancaster watched from the sidelines as Louisville surged to a 5-1 victory to return to the USL Cup. The following week, Spencer stepped up in Lancaster’s absence and netted a second-half strike that ensured the trophy wouldn’t change hands in 2018. So, after all of that, why would I think things will be different in 2019? Well, for starters, Lancaster is gone for good… and he’s not the only one. The 26-year-old forward, who joined Nashville SC after signing an MLS agreement with the Tennessee side this offseason, is one of four starters to move on from Hackworth’s squad ahead of the 2019 Championship campaign. Goalkeeper Greg Ranjitsingh and defender Kyle Smith departed the club to reunite with O’Connor in Orlando, while forward Ilija Ilic joined Eastern Conference foe Indy Eleven. With Lancaster and Ilic out of the picture, Louisville will have to replace its two leading goalscorers from last season that combined to score 36 of the side’s 71 goals. Yes, capable forwards like Spencer and the newly-arrived Lucky Mkosana are there, as is Brian Ownby, who had a second consecutive great postseason, but is that enough to stay atop the increasingly competitive Eastern Conference? 2018 USL Regular Season champion FC Cincinnati has moved on to Major League Soccer, but Nashville looks ready to fill that void before making its own move to the top flight. 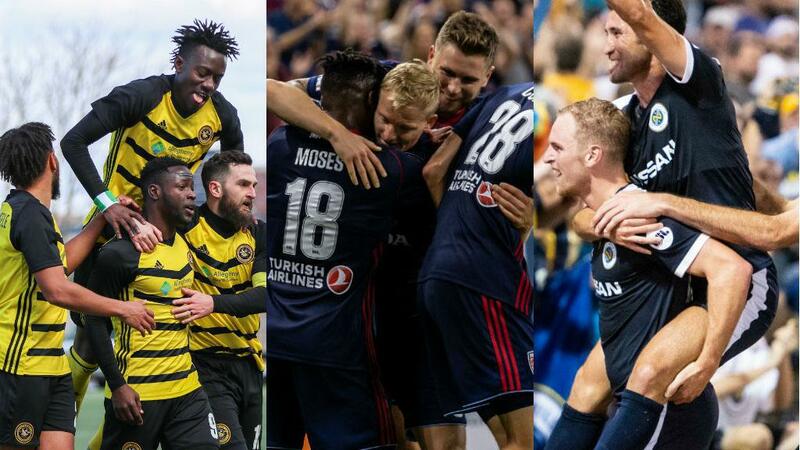 The club produced a strong showing in its inaugural season, finishing eighth in the Eastern Conference standings and taking FCC to penalties on the opening weekend of the postseason. Nashville boasted the second-best defensive record in the league last year, conceding just 31 goals in 34 regular-season matches, but failed to make the most out of that stabile back line because of inconsistent forward play. Upgrading the club’s attacking arsenal was a huge priority this offseason for General Manger Mike Jacobs, who brought in three new toys for Head Coach Gary Smith to play with in the form of Lancaster, Daniel Rios (North Carolina FC) and Kharlton Belmar (Sporting Kansas City). Rios scored 20 goals last season for NCFC and finished in a tie for second in the Golden Boot race with former Orange County SC forward Thomas Enevoldsen (more on him later), while Belmar netted 10 goals and added five assists in 20 appearances on loan with the Swope Park Rangers. If Smith can get them and Lancaster on the same page during the preseason – which gears up with a statement game against Louisville later this afternoon – Nashville will be the favorite to win the USL Cup. And it’s not just Nashville that Louisville will have to keep pace with. Indy looks likely to join the East’s elite in 2019 after a stellar offseason saw the club add Enevoldsen and the Championship’s all-time leading scorer Dane Kelly to its attack. Head Coach Martin Rennie’s squad will also welcome four former FCC contributors, including 2018 Golden Glove Evan Newton, and former Charleston Battery midfielder Neveal Hackshaw. Pittsburgh Riverhounds SC also poses a threat to end Louisville’s reign in the East, as Head Coach Bob Lilley continues to bring members of his 2015 USL Cup-winning Rochester Rhinos squad to the Steel City. Offseason arrivals Steevan Dos Santos and Christian Volesky, who combined for 18 goals during Rochester’s 2015 run, will link back up with midfielder Kenardo Forbes as the trio looks to recreate their previous success. On top of that you’ve got returnees to the Hounds’ squad that include All-League defender Joe Greenspan and talented forward Neco Brett, both set to be key figures for the club again. 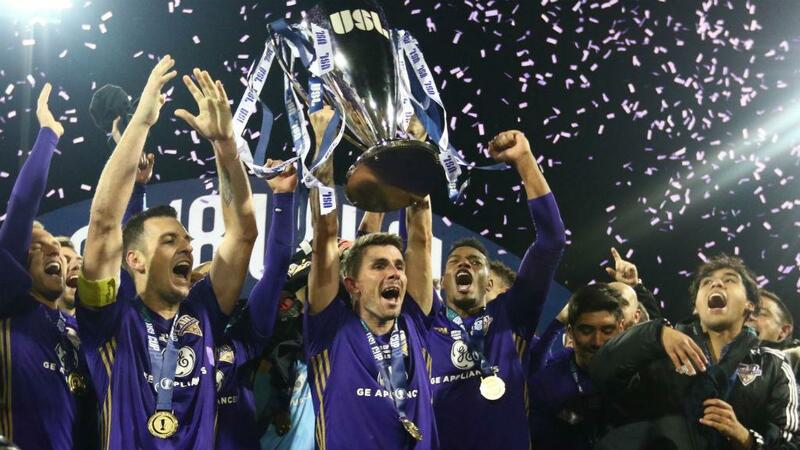 Pittsburgh Riverhounds SC, Indy Eleven and Nashville SC are expected to be among the East's elite in 2019 and challenge two-time defending champion Louisville City FC for the USL Cup. I’ve gotten this far without really mentioning the New York Red Bulls II, who have reached the Eastern Conference Final each of the past three years, or the perennial playoff participant that is the Charleston Battery, let alone potential bounce back candidates North Carolina FC and the Tampa Bay Rowdies. The Eastern Conference is loaded with talent heading into the 2019 season and Louisville enters the campaign with a target on its back as bright as the two gold stars that now adorn the front. Four weeks from today, when LouCity takes the field at NCFC on the opening Saturday of the regular season, it will do so with more obstacles in its path than ever before. The climb to a third consecutive USL Cup will have to go through a bevy of opposition gunning for the Eastern Conference crown, while also overcoming the club’s key departures and the pressure to three-peat in the process. I think that’s a task too tall for any club, even one as resilient as Louisville. How the team handles all of those challenges, as well as any other obstacles that pop up along the way, will surely be something to watch this year, but for now, all I can say is... Good luck.